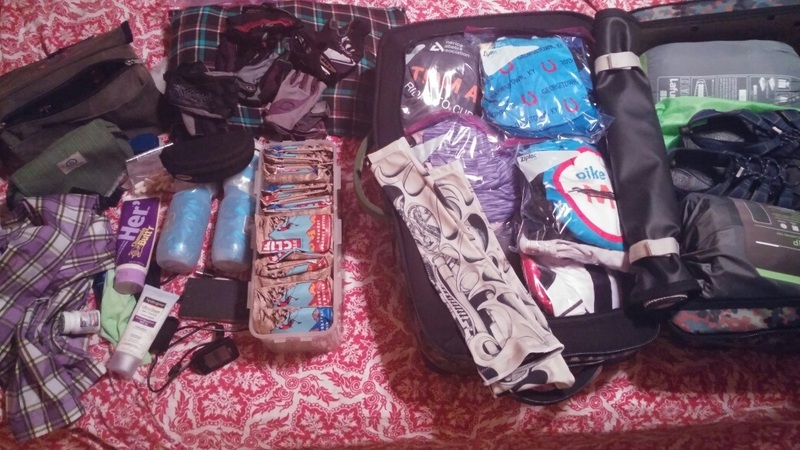 As I, the Reluctant Cyclist, prepare for another week-long bike trip I have a mental list that I go through while the departure date draws closer. Right now that date is two days away so I think I am winding down my preparations and nearing completion of packing. Tomorrow, the only thing I should have left to do is keep checking and praying the weather forecast remains cool and clear for the whole ride. Over-packing is a problem, and is also easy to do. Luckily this tour is supported so we can take a few luxuries that would otherwise be a hindrance, like extra snacks, several more changes of clothes, and more toiletries. I usually pack enough riding clothes to have a set each day. This trip I think I will cut back and just wash them at the end of the day. Bike clothes will dry hanging out overnight as long as Mother Nature cooperates and keeps us dry. So, first the bike basics – Bike shorts and jerseys, socks, helmet, gloves, head band (or sweat band), sunglasses, rain jacket, arm warmers, saddle cover, water bottles, lock, extra tubes, pump, handlebar bag or seat bag (or both), Bike computer. And don’t forget your bike! Extras if you are a reluctant cyclist – Nuts, applesauce, Cytomax, deck of cards, money for Fudge on Mackinac Island. Here is my mode of operation (MO). Leading up to the day of departure I will suffer every minor illness known to man (and woman). Headache, toothache, bloating, fatigue, cold and allergies, sore throat, acne. My bike will also have issues. Seat needs adjustment, gears won’t shift right, or they simply shift by themselves, brakes won’t release. Lucky for me, Bike Junkie is a patient and supportive partner. He also remembers all the stuff I listed above so that I don’t have to. If you haven’t guessed by the fudge reference we are headed to Michigan’s Upper Peninsula. The forecast looks marvelous, highs in the mid-seventies, lows in the fifties. I am thinking “what great weather for sleeping in”. Wishful thinking. We must be up and at ’em by about 7:00 a.m. every day so the camping gear can be packed and loaded before 9. Again, my MO is grumpy and slow in the morning, finally warming up about 30 to 90 minutes into the ride. Once I get going, I can just keep going. But oooooh baby, those first few lengths…! Throw a hill in there and you just might hear some choice words. Bike Junkie says getting me going in the morning is like starting a diesel engine, stiff and reluctant at first, but can run all day. I will try to keep my Most Recent Tour page up-to-date but the ride passes through some very rural areas and internet connections are sketchy at best.